Welcome to our ultimate guide for collecting every Power Moon from the Sand Kingdom in Super Mario Odyssey! 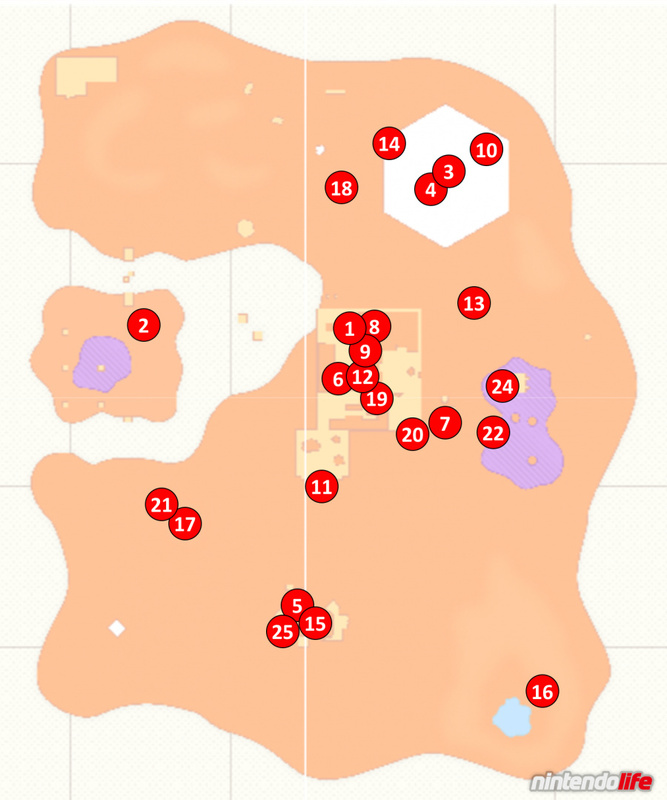 Below, you'll find maps detailing the exact location for all 89 of the Power Moons located in this Kingdom, as well as descriptions on how to get each and every one of them. 1. Atop the Highest Tower: This is your first task when you initially arrive at the Sand Kingdom. Keep climbing the tower as indicated by the game to find this Power Moon waiting for you on top. 2. Moon Shards in the Sand: Another required Power Moon, this time around you need to collect five Moon Shards. They are all scattered around the poison lake apart from one which is on top of a pillar. Capture a nearby Moe-Eye (the stones with sunglasses) and use its ability to see a path appear from the pillars above you - you'll then be able to collect the last shard. 3. Showdown on the Inverted Pyramid: You'll receive a Multi Moon for defeating Harriet of the Broodals on top of the Inverted Pyramid. 4. The Hole in the Desert: Once you've defeated the Broodal, a hole will open in the ground below the Inverted Pyramid. Enter this hole and make your way through until you reach another boss battle. Win here and you'll receive yet another Multi Moon. 5. Overlooking the Desert Town: This Power Moon is sitting inside a bell tower at location number 5 on our map. Simply jump up to the top and collect it. 6. Alcove in the Ruins: In the ruins you'll see a large slide of sand that Mario cannot jump through. Head towards the slide but look to the right to find a small alcove with a Power Moon inside. 7. On the Leaning Pillar: On the mainland of the ruins near location number 7 on our map, you will find a couple of Bullet Bills being fired towards you. Capture one, and then direct it over to this leaning pillar to collect the Power Moon. 8. Hidden Room in the Flowing Sands: Head towards location number 8 on our map and jump into the large square patch of quicksand. On the western wall you'll see a slight gap where the building meets the sand. Head to that point and let Mario sink until his head is just under this gap. Then push your left control stick forwards and keep jumping frantically to make Mario reach a secret room underneath the sand. Inside, you'll find a Power Moon. 9. Secret of the Mural: Head inside the 2D Mario section that circles the tower. Just before you exit at the top, jump back down onto the moving platform as it touches the left wall. If you walk into this wall you'll find a tiny hidden area with a Power Moon. 10. Secret of the Inverted Mural: In the 2D Mario section on the Inverted Pyramid, you'll eventually come to a part where you can see two green pipes. Go past these pipes and jump through a crack in the wall to find a hidden Power Moon. 11. On Top of the Stone Archway: By using one of the power lines from the small town area near the Odyssey, you will be able to zip right over a Power Moon that is sitting on an otherwise impossible to reach archway. Jump off the zip wire at just the right time to grab it. 12. From a Crate in the Ruins: When you reach the top of the first 2D Mario mural, you'll see some crates nearby. Smash the glowing crate to reveal a Power Moon, and then use a Bullet Bill to fly over to its new location. 13. On the Lone Pillar: From the Tostrena Ruins Round Tower checkpoint, capture Glydon (the flying dragon-lizard-thingy) and glide towards location 13 on our map. You'll be able to reach a pillar with a Power Moon sitting right on top. 14. On the Statue’s Tail: On top of the Inverted Pyramid, you'll notice that one of the Jaxi Statues' tail is glowing. Hold down the 'Y' button to throw Cappy at the tail and, after a short time, a Power Moon will pop right out. 15. Hang Your Hat on the Fountain: Find the fountain in the main, small town area near the Odyssey. Hold down the 'Y' button to throw Cappy at the golden part at the top and a Power Moon will eventually come out. 16. Where the Birds Gather: Head to location number 16 on our map (near the Oasis) and you'll see a small group of birds sitting on a small lump in the sand. Ground pound this spot to uncover a Power Moon. 17. Top of a Dune: Head to location number 17 on our map to find the tallest dune in the Kingdom. Make your way to the top of this dune and use the HD Rumble in your controller(s) to feel a Power Moon underground. When you're on the strongest spot, ground pound! 18. Lost in the Luggage: If you head to location number 18 on our map, you should be able to find a glowing spot in the sound that will reward you with a Power Moon if you ground pound it. Depending on how far through the Kingdom you have progressed, it will either be near a taxi frozen in the ice, or a couple of car tires and boxes. 19. Bullet Bill Breakthrough: Capture the first Bullet Bill in the ruins and use it to fly through the hole in the wall just behind it. Doing this will allow you to use the Bullet Bill to smash the giant cage inside, freeing a Power Moon. 20. Inside a Block Is a Hard Place: Head to the Tostarena Ruins Sand Pillar checkpoint and jump down to the area below. On the far side of this little area you'll see a glowing block - simply use the nearby Bullet Bill to smash it open and collect the Power Moon inside. 21. Bird Traveling the Desert: If you look out for it, you should notice a bird flying around the bottom half of the Kingdom and, if you can touch it, you will receive a Power Moon. We managed to make contact at location number 21 on our map but it travels between this spot and the oasis on the eastern side of the Kingdom. 22. Bird Traveling the Wastes: A second bird can be found flying around the poison lake on the eastern side of the Kingdom. Once again, simply make contact with the bird to receive a Power Moon. 23. The Lurker Under the Stone (see location 3): Head back to the top of the Inverted Pyramid and you'll notice a bump in the ground that keeps moving around. Use Cappy to stun the bump and then ground pound it when it's still to reveal a Power Moon. 24. The Treasure of Jaxi Ruins: Head through the entire Ice Cave (located by entering the whirlpool-like area of quicksand in the ruins) until you reach the exit. You'll emerge on a small platform that has two chests on it - use Cappy to open the one on the left to reveal a Power Moon. 25. Desert Gardening: Plaza Seed: Underneath where Talkatoo is perching in the main area of town, you'll see three plant pots. If you throw the seed that can be found right in front of them into one of these pots, it will slowly start to grow. When it reaches full height, you'll be able to throw Cappy at it to receive a Power Moon. 26. Desert Gardening: Ruins Seed: If you haven't already encountered the plant pots, make sure to read our description for Power Moon number 25 above first. Now head to location number 26 to find the second seed - it is located in a small alcove on the outside of the eastern wall of the ruins. Bring the seed back to repeat the process and eventually collect a Power Moon. 27. Desert Gardening: Seed on the Cliff: If you haven't already encountered the plant pots, make sure to read our description for Power Moon number 25 above first. Now head to location number 27 to find the third and final seed - you'll need to drop down onto a small ledge on the side of the cliff to find it. 28. Sand Kingdom Timer Challenge 1: Head to the ruins at the furthest northwest point on the map and throw Cappy at the scarecrow sitting on the roof. Use a combination of rolls and wall jumps to make your way to the Moon before the timer runs out. 29. Sand Kingdom Timer Challenge 2: In the southwest corner of the poison lake near the Moe-Eyes, you should be able to spot a P Switch. Step on it with a Moe-Eye and use its sight ability to see a new path extend over the poison. Grab the key - and then the Power Moon - before the time runs out by switching the sunglasses on and off as and when you need them. 30. Sand Kingdom Timer Challenge 3: You'll find another scarecrow at location 30 on our map. Throw Cappy at it to make blocks appear over the poison. You can either try to run and jump your way across these within the time limit or, if that's a little too hard, you can use a Jaxi to run over the poison instead. 31. Found in the Sand! Good Dog! : You'll find a dog standing just in front of the main town area near the Odyssey and, if you stand near him for a short while, he'll lead you to a spot in the ground. After he has uncovered a glowing spot, use a ground pound to reveal a Power Moon. 32. Taking Notes: Jump on the Palm: Head to the oasis area in the southeast part of the map and look for a large treble clef on top of one of the palm trees. Touch it, and then collect the notes that appear on top of the trees, to collect your Power Moon. 33. Herding Sheep in the Dunes: At location number 33 on our map, you'll find a local resident sitting inside a circle of stone. He'll tell you that he has lost three sheep - you need to get these sheep back into that circle to receive the Power Moon. They are all located close by in the northern section of the map - simply throw Cappy at them from behind to send them flying in the direction you want them to go. 34. Fishing in the Oasis: Head to the oasis area (in the southeast) and capture the Lakitu hovering by the water. Use his fishing ability to lure out the largest shadow from the water to reveal a Cheep Cheep who will reward you with a Power Moon. 35. 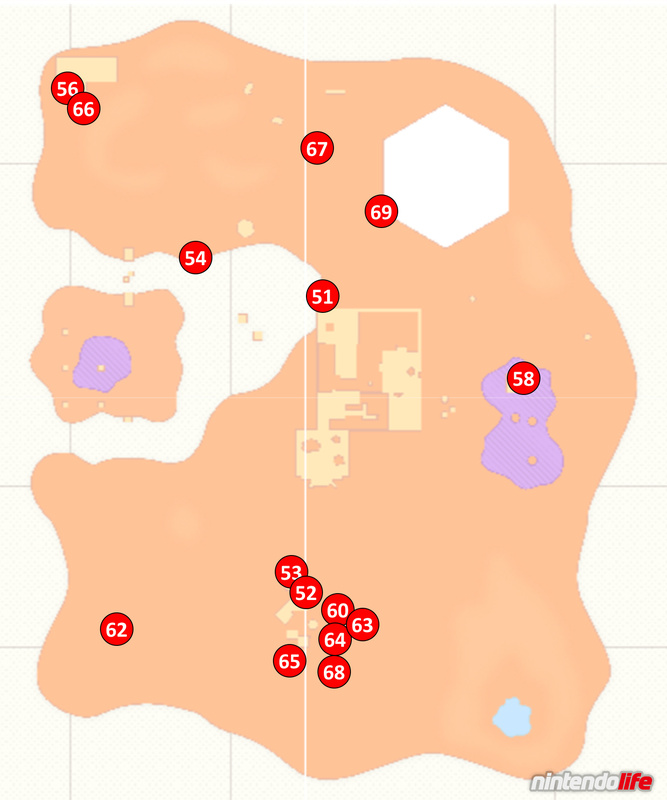 Love in the Heart of the Desert: You'll find a Goombette at location 35 on our map (in the ruins section near the Bullet Bills). You can either build a tower of Goombas by capturing one and then jumping on others - taking this over to the Goombette when you're tall enough to make eye contact with her, or you can capture one Goomba and take it over to the spinning flower near the second Bullet Bill. Use 'ZL' to release the Goomba temporarily, hit the flower with Cappy, and then recapture the Goomba and fly up to the ledge with the Goombette. She'll give you a Power Moon for your troubles. 36. Among the Five Cactuses: Grab yourself a Jaxi, and then head right up to location number 36 on our map (right at the top in the centre). You'll find a row of cacti and, by smashing the tall middle one, you'll reveal a Power Moon. 37. You’re Quite a Catch, Captain Toad! : Start by capturing the Lakitu by the oasis in the southeast corner of the map. Fly north until you reach an area with three cacti and a noticeboard. Cast your line into the sand to attract the largest silhouette you can see - it turns out to be Captain Toad! He'll give you a Power Moon as a thanks for rescuing him. 38. Jaxi Reunion! : Just northeast of the oasis you'll find a statue of a Jaxi with an empty spot for another statue to be placed. Take a living Jaxi over to that spot to be rewarded with a Power Moon. 39. Welcome Back, Jaxi! : Head to the top of the Inverted Pyramid and call a Jaxi using the 'Jaxi-stop'. Ride the Jaxi over to the only corner of the Pyramid that doesn't have a statue on it to reveal a Power Moon. 40. Wandering Cactus: At location 40 on our map (just below the eastern poison lake) you'll find a cactus with a green button on its top. Capture the cactus and move it away from its original standing space to find a glowing spot in the sand - ground pound this to reveal a Power Moon. 41. Sand Quiz: Wonderful! : This Power Moon will only be available to you if you have already obtained Power Moon number 51. If you have already spoken to the Sphynx once, do so again to be quizzed for a second time. If you need help with the answers to its questions, they are: 30, Ice, 5, and Sphynx. 42. Shopping in Tostarena: Simply head to this Kingdom's Crazy Cap store and purchase this Power Moon for 100 Gold Coins. 43. Employees Only: Just behind the Crazy Cap store is a small grate that has been busted open with a few coins inside. Crouch to enter this little hidden passageway and follow it through until you end up behind the counter of the store. The Power Moon is waiting for you right there. 44. Sand Kingdom Slots: For this Power Moon, simply head to the building offering a game of slots in the main town area and talk to the assistant. You'll need to throw Cappy at the spinning icons to make them all stop on the Power Moon. 45. Walking the Desert! : This one can be a little tricky. Head to location 45 on our map to find a Koopa wearing a sombrero. He'll ask you to take part in a walking challenge and, if you can complete it, he'll reward you with a Power Moon. Our best advice for the challenge is to pay attention to the circle when it first appears and take note of where it lies in relation to the cacti and bushes surrounding it. Use those as a reference point when you walk around. 46. Hidden Room in the Inverted Pyramid: Inside the Inverted Pyramid, you'll eventually enter a room where you need to use a Bullet Bill to fly through pillars that are on a sort of conveyor belt going from right to left. When you reach this room, capture a Bullet Bill and use 'ZL' to jump out of it at just the right time to land on the conveyor belt (in between your choice of pillars). You'll get taken through the left wall with the pillars and find yourself in a hidden room containing a Power Moon! 47. Underground Treasure Chest (see location 46): Enter the giant hole beneath the Inverted Pyramid and make your way through the majority of its rooms. Eventually you'll reach an area where you need to fly a Bullet Bill past some pillars to a patch of ice, and then a second Bullet Bill to the exit. Instead of flying the first one to the patch of ice, take it around the right hand side of the structure to reach some hidden steps. Use the spinning flower to get on top of the structure and make your way along the thin path to reach a platform with a treasure chest on top - there is a Power Moon waiting inside. 48. Goomba Tower Assembly (see location 46): Inside the giant hole underneath the Inverted Pyramid, you'll notice a large tower of Goombas waddling around one of the earlier sections. Capture this tower and collect more Goombas by jumping on them until you can jump to reach the Power Moon that is floating in the air nearby. 49. Under the Mummy’s Curse: Head to location number 49 on our map and jump down into the hole in the ground (you can't miss it). Inside this room, keep defeating the enemies that surround you until a Power Moon pops out. 50. Ice Cave Treasure: Jump into the large whirlpool-like bit of quicksand in the ruins and make you way through the majority of the Ice Cave below. The last set of pillars (just before the green pipe at the end) have another set of pillars hovering above them in the air. Wall jump between two of the pillars when they touch the ground, timing it just right to continue your wall jumping up onto the second set of pillars above them. When you're on the top, jump across the pillars to collect the Power Moon hovering at the end. 51. Sphynx’s Treasure Vault: On the northwest edge of the ruins you'll find a huge Sphynx. The Sphynx will ask you a question - get it right (by answering with 'Coin') - and you'll receive a Power Moon. 52. A Rumble from the Sandy Floor: In the main town area near the Odyssey, you'll find a green pipe not far away from Talkatoo. Enter the pipe and use the HD Rumble of your controller(s) inside to locate the Power Moon underground - a ground pound on the right spot will make it appear. 53. Dancing with New Friends: On the northwest edge of town there is back door entrance guarded by a resident in a sombrero. To enter, you must be wearing the Sombrero and Poncho clothing items from this region's Crazy Cap store. Simply stand on the large circle inside to claim your Power Moon. 54. The Invisible Maze: Head to location number 54 to find a red hat door (you'll notice a column of coins showing you the way down from the cliff's edge). Use the Moe-Eyes in memorise each floor pattern and reach the end to get the Power Moon. 55. Skull Sign in the Transparent Maze (see location 54): In the same hidden area as Power Moon number 54, you'll notice a signpost with a skull on it in the first room. Throw Cappy at it for a while by holding down the 'Y' button and a Power Moon will eventually pop out. 56. The Bullet Bill Maze: Break Through! : On the front wall of the ruins in the northwest region of the map you'll see a red door. Go inside and use the Bullet Bills to travel to the end of the maze - a Power Moon will be waiting for you. 57. The Bullet Bill Maze: Side Path (see location 56): In the same maze room as Power Moon number 56, you'll notice a separate path that leads off to the left just before you reach the first set of rotating walls. Replace your Bullet Bill nearby and fly all the way around this alternative path to find another Power Moon. 58. Jaxi Driver: Capture a Jaxi and head to location number 58 on our map to find an entrance that goes under the poison lake (if you can warp to the Jaxi Ruins checkpoint that would be ideal). When you're inside the secret room, use your Jaxi to reach the end and grab the Power Moon waiting for you. 59. Jaxi Stunt Driving (see location 58): In the same room as Power Moon number 58, use your Jaxi to touch the large treble clef in the central area. You'll need to touch all of the music notes that appear by charging down one side of them, braking heavily, and returning the other way. A Power Moon is yours if you can manage it. 60. Strange Neighborhood: In the middle of the town area near the Odyssey, a rocket is sitting on top of one of the buildings. Capture that rocket and use it to fly to a secret area - reach the end of this area to collect a Power Moon. 61. Above a Strange Neighborhood (see location 60): In the same secret area as Power Moon 60, progress through the course until you see a small tower of three Goombas and a platform to the right with three blocks hovering in the air. Jump on top of the middle block and then jump up again to reveal a hidden block - jumping on this new block will allow you to reach a second Power Moon hovering just above you. 62. Secret Path to Tostarena! : As 'Secret Path' Power Moons often are, this one is pretty complicated. To get this Moon, you will need to use a warp painting from a different world - but there's a catch. The warp painting you need will be in one of two places - either Lake Kingdom, or Wooded Kingdom - and this will depend on which of these you decided to travel to first on your initial play-through. You need to head to the Kingdom you visited first. If you went to Lake Kingdom first, head there and travel to the Courtyard checkpoint flag. Right next to the flag is a small pool and if you closely at the deep end, you'll notice a warp painting down below. Dive down and enter the painting to warp back to the Sand Kingdom and grab your Power Moon. If you went to Wooded Kingdom first, head to the Forest Charging Station checkpoint and throw Cappy at the scarecrow in one of the charging machines. Jump up quickly onto the platforms that appear, making it all the way to the top, and then use a backflip to jump from the top platform onto the scenery above. Walk over to the right and you'll see a block with the warp painting attached to one side - head inside and warp to the Sand Kingdom for your Power Moon. 63. Found with Sand Kingdom Art: In the east side of the town area near the Odyssey, you'll find some hint art that resembles Bowser's Kingdom. To get this Moon, you'll need to fly to Bowser's Kingdom and warp to the Souvenir Shop checkpoint. From the flag, walk across three stones and ground pound that one to reveal a Power Moon. 64. Jammin’ in the Sand Kingdom: In the town area located near the Odyssey, you'll find a Toad wearing some headphones on top of one of the buildings. Play him the track 'Broodals Battle' and he'll give you a Power Moon. 65. Hat-and-Seek: In the Sand: Just before you enter the town area (from the Odyssey's location) you'll notice a resident of the Cap Kingdom nearby - talking to him reveals that he's lost a friend. 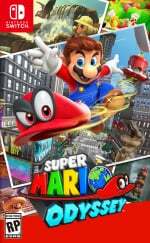 Now walk over to the group of characters standing in front of a small purple building and talk to the one who is wearing a sombrero with eyes like Cappy to receive a Power Moon. 66. Sand Kingdom Regular Cup: Head to the ruins in the northwest corner of the map to find a Koopa standing next to a leaderboard. Talk to him and defeat him in a race to collect a Power Moon. The race is easy to win - simply jump onto the Jaxi just to the left of your starting position and use him to charge towards the goal. 67. Binding Band Returned: Head to location 67 on our map to find a hole that will take you underground. Ignore the Chinchos (mummy-type things) in front of you and jump into the slingshot which will fire you over to the giant Binding Band. Do a ground pound on top of the diamond to receive a Power Moon. 68. Round-the-World Tourist: This one takes a bit of time but it will net you several Power Moons along the way. You'll first need to talk to the Tostarenan standing next to the taxi just in front of the town area. He'll tell you about where he wants to visit in his taxi and you must keep travelling from Kingdom to Kingdom - finding him in his new location. If you need some help, he travels to the following Kingdoms: Metro, Cascade, Luncheon, Moon and Mushroom, before eventually returning to the Sand Kingdom which allows you to collect this Moon. 69. 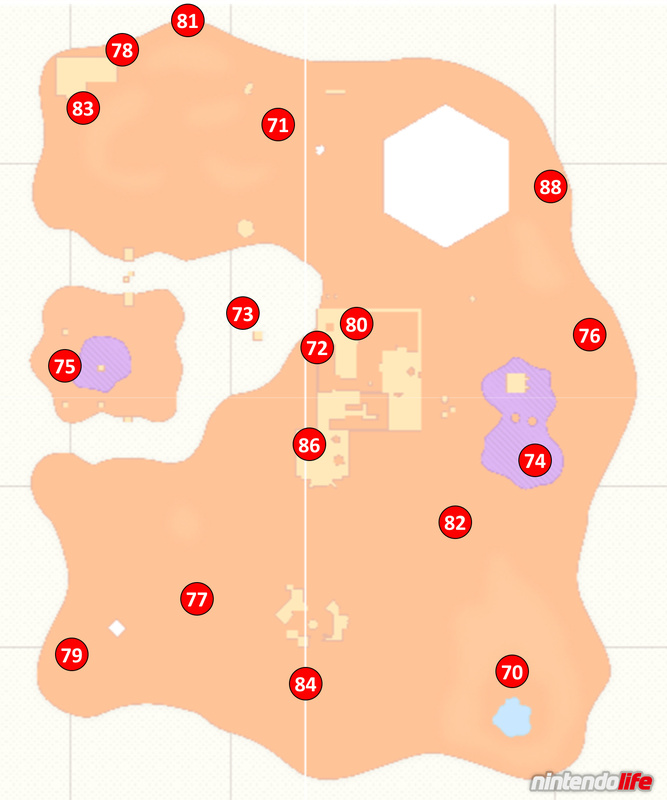 Peach in the Sand Kingdom: Head to the top of the Inverted Pyramid and run to the corner indicated by number 69 on our map above. You'll find Peach standing there and she'll give you a Power Moon if you talk to her. 70. Mighty Leap from the Palm Tree! : In the oasis area in the southeast corner of the map, climb the palm tree just behind the checkpoint flag to find a Power Moon sitting above it. Perform a backflip to make contact with it. 71. On the North Pillar: For this Power Moon, you need to start by zipping along the electrical wire that connects the Inverted Pyramid to the ruins in the northwest corner of the map (you can start at either location). As you travel along the wire, you'll notice a Power Moon located on a pillar below you - jump off the wire with 'ZL' at just the right time to land on the pillar and collect your Moon. 72. Into the Flowing Sands: In the ruins - at location 72 on our map - you'll notice a Power Moon sitting in plain sight on the large slide of quicksand. Stand on any piece of land above this Power Moon and jump down to make contact with it. 73. In the Skies Above the Canyon: Head to the Tostarena Ruins Round Tower checkpoint and turn west to find some moving platforms. Walk onto the first platform and, just before it is about to drop down to the sand below, jump off to reach the Power Moon hovering nearby. 74. Island in the Poison Swamp: Capture a Jaxi and head to location number 74 on our map. When you arrive at the poison lake you'll see a Power Moon hovering above a small mount of sand - simply run over to it with the Jaxi to collect it. 75. An Invisible Gleam: Head to the Moe-Eye Habitat checkpoint and capture one to make use of its sunglasses ability. Walk over to the platform that raises you up onto the pillars above and use the Moe-Eye to walk along the hidden path. You'll notice a hidden glowing section on top of the second pillar - ground pound this spot to receive a Power Moon. 76. On the Eastern Pillar: This is by far one of the hardest Power Moons to acquire in the entire game - although there is a small trick to learn! Start by warping to the Tostarena Ruins Sand Pillar checkpoint and capture one of the Bullet Bills below. Fly over to the leaning tower that has a Power Moon floating on top to the east. From there, turn around to watch more Bullet Bills firing towards you and, as soon as one manages to get around the ruins on the mainland and is heading your way, jump over to the pillar next to you so that the Bullet Bill changes direction. You'll need to capture the Bullet Bill and fly it in an easterly direction towards location number 76 on our map. For the Bullet Bill to fly that far you'll need to either capture it at the latest possible point - jumping off the pillar in the direction of your goal and throwing Cappy backwards to grab it - or capture it and then shake your controllers like crazy to make it boost forwards as many times as you can (something we very annoyingly overlooked the first time around!). When you've captured your Bullet Bill, zoom towards location number 76 as quickly as you can - if you get there on time the Bullet Bill will smash a rock which has a Power Moon inside. 77. Caught Hopping in the Desert! : At location number 77 on our map you'll find a group of rabbits. Only one of them is holding a Power Moon so keep chasing them - using Cappy to stun them if necessary - and make contact with them to see what they are holding. Eventually (or on the first run if you're lucky) you'll get the Power Moon. 78. Poster Cleanup: Behind the ruins in the northwest corner of the map you'll find a local who wants the wedding posters removed from the building. Talk to him, and then use a combination of jumps and Cappy throws to remove every last poster - the Power Moon will then be yours. 79. Taking Notes: Running Down: Take a Jaxi to location number 79 on our map. When you arrive you'll notice a glowing treble clef - you need to touch the treble clef and then collect every music note that appears. The trick here is to learn exactly where to line up your Jaxi's run to collect all the notes in time (starting from directly behind the treble clef is your best bet). 80. Taking Notes: In the Wall Painting: Head inside the 2D Mario mural on the Tostarena Ruins Round Tower (accessed easily by the corresponding checkpoint). You'll notice a treble clef inside which will spawn several music notes - collect all of the notes before the timer runs out to collect a Power Moon. 81. Love at the Edge of the Desert: A Goombette is looking for love right at the very top of the Kingdom (location 81 on our map). Warp to the Tostarena Ruins Entrance, capture a nearby Goomba, and begin your incredibly long journey for love to that location. When you finally arrive you'll receive a Power Moon. 82. More Walking in the Desert! : Return to the Koopa wearing a sombrero at location 82 on our map to start a second walking challenge. As before, the trick to this Power Moon is to memorise how the track you need to follow sits within the scenery - take note of where the lines are in relation to nearby cacti and bushes. Perform the walk successfully enough and you'll receive a Power Moon. 83. Sand Kingdom Master Cup: Return to the Koopa near the ruins in the northwest corner of the map to challenge him to a second race. The best approach for this race is to jump on the Jaxi who is sitting just to the left of your starting position. Ride him all the way to the goal and win to claim your prize. 84. Where the Transparent Platforms End: Head to location 84 on our map (just below the town area) to find a grey warp pipe. Once inside, make your way to the end by using the nearby Moe-Eye's sight ability and grab the Power Moon that is waiting for you. 85. Jump Onto the Transparent Lift (see location 84): Inside the same room as Power Moon 84, capture the Moe-Eye and walk onto the second, longer hidden platform that can be seen with his glasses. When it almost reaches the wall on the right, you'll be able to drop off onto a platform right down below you. Collect the key that is located on this platform to unlock a Power Moon above. 86. Colossal Ruins: Dash Jump! : Right next to the Tostarena Ruins Entrance checkpoint is a grey pipe. When inside, use the flowers to speed your way through the room until you make it to the Power Moon waiting for you at the end. 87. Sinking Colossal Ruins: Hurry! (see location 86): In the same room as Power Moon number 86, you'll need to make sure to collect the golden key in the more complex part of the speedy section (located quite far down and near the end of that wall) and still make it back to the top. If you reach the end on the same run as collecting the key you'll be able to grab a second Power Moon. 88. Through the Freezing Waterway: If you head to location number 88 on our map you'll find a grey pipe (the quickest way to reach it is to jump off the Inverted Pyramid). Once inside, use the Gushens to navigate through the room - using a combination of their upwards and sideways boosts to reach the Power Moon at the end. 89. Freezing Waterway: Hidden Room (see location 88): In the same secret area as Power Moon number 88, use the Gushens to travel through the room until the section just after the first set of three gold rings. From here, burst up onto the moving platform, and then burst up and over to the left to find a hidden section of the room. Make your way through this section to find the Power Moon waiting for you. We hope that you have found this guide on collecting all Power Moons in Super Mario Odyssey's Sand Kingdom useful. Let us know if you've managed to grab them all with a comment below. Have To skip the guide because I want to do everything by myself. This game is awesome!! I have so much pleasure with it. Glad Nintendo is on the track again. Big hope for the Switch in the futur. I just curious about Sand Kingdom. Why does Mario shiver or sweat by certain outfits ? @Anti-Matter because there is cold in Sand Kingdom. @Anti-Matter When you first arrive everything is frozen, until after you beat the primary boss of the stage, then it turns into a more traditional desert. I assume Nintendo did this so that only some of the moons and missions are available at first... then more stuff "unlocks" when the desert heat returns and things melt. It probably would have been too overwhelming to the player if everything were available immediately... especially in such an early and large kingdom. The number of times the bullet exploded just short of the eastern pillar was insanely frustrating... that was the only one that gave me any trouble in this kingdom. So that is how you do the eastern pillar... I’ve tried that several times but to no avail, keep exploding just before. I’ll just have to keep trying! @datamonkey Pro Controllers are lovely, and I use mine for the vast majority of games that I play. Odyssey is such a natural fit for the Joy-Cons though - after a short while the entire game feels effortless to play with them. @chewytapeworm It is tricky - shaking the controller as much as possible is definitely the best advice we can give! My favorite character is the Sphinx, that guy is hilarious. Nice. I just 100%ed the game. That eastern pillar one took me half an hour to do, haha. @RyanCraddock Ah ok thanks for the feedback, I will probably stick with the joycons then! I was just concerned some of the trickier jumps might be difficult to pull off as I have a bit of difficulty using both of the trigger buttons thanks to my hands! Trying to do as much as I can by myself, and on 789 moons, but 76. Eastern Pillars was proving impossible! Just checked to see if I'd been trying the right thing, which I had, although slightly annoyed to find another moon which you seem to have to use motion controls to obtain! I almost exclusively play in handheld mode and feel Nintendo really should have made the move set the same regardless of how you play. @Shinnos You can get that Moon without motion controls - I did - but it is admittedly much easier if you can use them. I’ve beat the boss in this kingdom but haven’t beat the main game yet. I’m not able to get moons 63-69. How do I get them?? ?